With a run of concerts at the Public Theater, Sting is putting more pieces in place for the launch of a Broadway musical called "The Last Ship." To compose the score, the former Police frontman drew on characters and imagery from the doomed shipyard in his hometown of Wallsend, England. The musical, which Sting is developing with a squad of theater elite, starts a tryout run this summer in Chicago before opening on Broadway next fall. 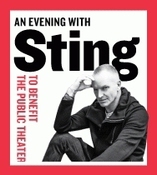 Sting is hoping to prime interest in the musical with his 10-concert series at the Public, which ends on Wednesday. During the intimate show, which also features vocalists such as cast member Jimmy Nail, Sting plays acoustic guitar and sings in a thick brogue, voicing various characters. He is accompanied by a small band that includes fiddle and accordion players. Between songs that blend Broadway anthems with folk sounds from the British Isles, he tells anecdotes from his childhood and the process of creating a musical. This week, after the release of the companion album "The Last Ship," Sting's first set of original material in eight years, the singer paused to discuss songwriting, his accent and the spotty track record of rock stars on Broadway. What purpose do the shows at the Public Theater serve in the longer process of developing the musical? I've written far more songs than would be needed in a musical - about 30 of them. What to do with those other songs? Either they weren't advancing the narrative, or the characters they were written for have evolved into something else. So why don't I present the songs in a sort of revue and bring the audience into that process? Also, by singing them you learn a great deal about how the arrangements need to be finished. It also gives you a chance to own these songs before handing them over to the actors. I imagine if and when this thing launches to the world without me, I will feel something of a tug, a kind of postpartum depression. At the same time, my intention was to write this thing and be a producer and get out of the way. What I had suffered in the previous eight years was a kind of block. As a songwriter, there's a certain amount of inward navel-gazing, and I didn't want to do that anymore. So I wanted to write for other characters, and as soon as I did that, the songs just flowed. But after that initial flow came the painstaking job of refining them for the musical. I've been blessed to work with an esteemed team of people. When they tell me something isn't working, I might go into a momentary sulk. At the same time, I feel I'm in safe hands. I had gotten pretty good at writing three- or four-minute narrative songs. This is a narrative over 2½ hours. There is no time to wait while one of your characters expresses one emotion in a song. You also have to think in more blunt commercial terms - this music eventually needs to sell tickets. I'm very keen to write earworms, things that will be catchy and will get people to leave the theater singing. I've done that in my pop career, but at the same time I didn't want to do a rock musical. I wanted to honor the regional music of the place I come from and the tradition of musical theater. My education wasn't just rock 'n' roll. It was the complete canon of Rodgers and Hammerstein and "My Fair Lady" and "West Side Story." As a kid I ate those records up. How does theater culture differ from that of rock? It is a community, and there is a buzz. I also love the idea of going to work in the same place every day. Clocking on, putting the hours in, going home. That's unusual for me, because I'm normally in a different city or country every day. I find it very welcoming. I haven't come in as God's gift to theater. I've come to learn. Many successful rock stars have met a harsh reality on Broadway. It's littered with corpses. It's a valley of death. It doesn't deter me, but the odds against succeeding are long, for anybody. It's a tough business. Did you ever work in the shipyard in Wallsend? I used to deliver milk to the yards when I was a kid. There weren't many other clues in my environment about what I could do, except for the thousands of men walking to work every day. Some of the worst working conditions in Western Europe, yet the workers took enormous pride in the ships they created. It's ironic. You spend so much energy getting out of there, and here I'm back. How would you describe the brogue you're singing with? My town is on the border of Scotland, but the musicality of the dialect is almost Scandinavian. It's almost unintelligible to the rest of England, and that's somewhat deliberate. That's my real accent. But I only use it unconsciously when I'm angry or really emotional. My kids would always say, "Oh, he means it. He's speaking in that funny voice." What stage of development are you in with the musical itself? We're still writing. You fix one problem here, and that creates another hole there. It's like wallpaper that you have to adjust. And I play this game of, "Can't you reconsider this song that you turned down six months ago?" We have a workshop based on movement next month with choreographer Steven Hoggett. Then we have a casting session. Do you know which theater you'll be in when it comes to Broadway? Not yet. I don't want a huge theater. I don't want this to be a massively expensive production relying on mechanical wonders. I'm saying nothing! My ideal would be to have a production that could be reproduced with one teacher playing guitar and a classroom of kids singing it. It's a human story. I just don't want it to be an albatross around our neck of money and ridiculous things. It's a play. It should be put on simply. I was lucky enough to being one of the fans who won to attend the 10-2 performance. Absolutely stunning performances of Sting and the band--A wonderful arrangement, the experience will resonate for life. The Last Ship succeeds in capturing the atmosphere of mystique and melancholy of the shipyards. Another gem in Sting's prolific career. Thank you!